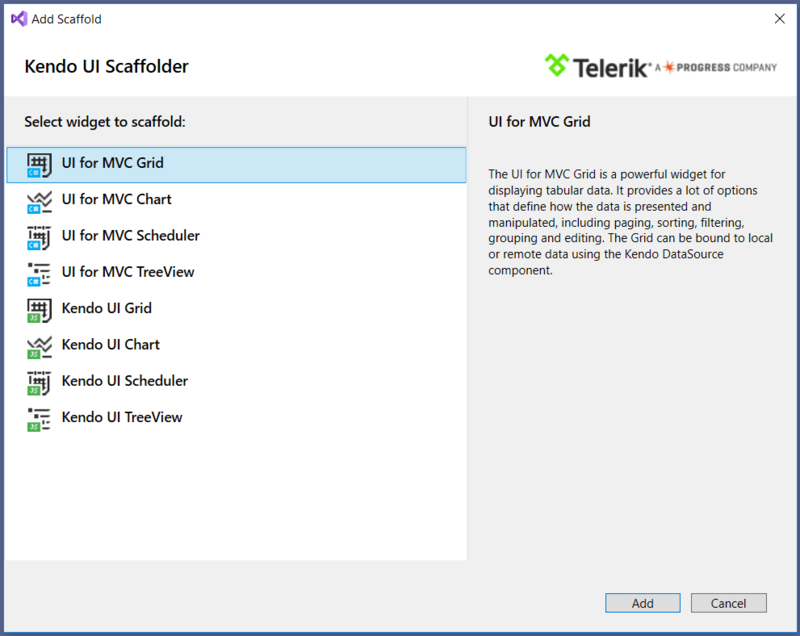 This article demonstrates how to scaffold a Kendo UI Grid for ASP.NET MVC by using the Kendo UI Scaffolder Visual Studio extension. The Kendo UI Scaffolder will not include the required UI for ASP.NET MVC files to the project. 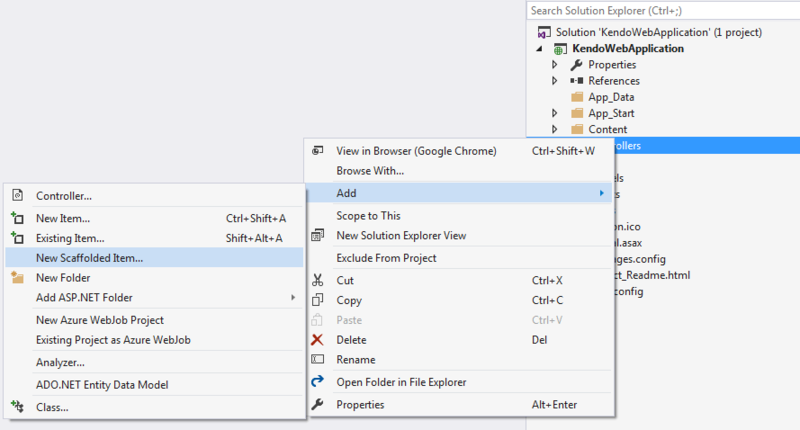 To automatically achieve this, use the Telerik UI for ASP.NET MVC Visual Studio Extensions. To manually achieve this, refer to this article. Below are listed the steps for you to follow when scaffolding the Kendo UI Grid. Create a new ASP.NET MVC application, include an Entity Framework Data Model and add Telerik UI for ASP.NET MVC. If you have already done so, move on to the next step. Otherwise, follow the first four steps described in this article. Right-click the location where the Grid Controller should be generated. Select Add > New Scaffolded item... from the displayed menu. In this example, you generate it in the Controllers folder. Select Kendo UI Scaffolder from the list of available scaffolders. On the next screen, you are presented with the Model and Data Context options. Enter the Controller and View names. The Model Class DropDownList contains all model types from the active project. In this example, you list products in the Grid. Select the Product entity. From the Data Context Class DropDownList, select the Entity Framework Data Model class to be used. In this example it is NorthwindEntities. (Optional) In some scenarios it is convenient to use view model objects instead of the entities returned by the Entity Framework. If this is the case, check the Use an existing ViewModel checkbox. It displays a DropDownList similar to the first one, from which you can select the ViewModel to be used. If you have not created it yet, add a new class to the ~/Models folder. Name it ProductViewModel. Select the ProductViewModel class from the ViewModel Class DropDownList. The names of the properties in the ViewModel must be exactly the same as the corresponding ones in the Entity. Otherwise, the Kendo UI Scaffolder is not able to link them correctly. Click the Grid options item on the left. DataSource Type—Ajax, Server, or WebApi. Editable—Enable the editing, configure the edit mode—InLine, InCell, or PopUp—and the operations to be included—Create, Update, Destroy. Filterable—Enable the filtering of the Grid and select the filter mode. Column Menu—Enable the column menu. Pageable—Enable the paging of the Grid. Scrollable—Enable the scrolling of the Grid table. Selectable—Enable the selection and specify the selection mode and type. Sortable—Enable the sorting and specify the sorting mode. Excel Export—Enable the Excel export functionality. PDF Export—Enable the PDF export functionality. Click the Events item on the left. From this screen you could select the Grid events that you would like to attach handlers to. Not all events are supported in the server-binding mode. To see the complete list, refer to this article. When finished with the Grid configuration, click Add at the bottom. The Grid Controller and the corresponding View are now generated.